With April, comes a new Top of the Tree. This month, the French AMX 50 B shines under the spotlight. But where does this tank come from? Let's dive into its fascinating backstory right now. After World War II, the French army had no modern tanks in its arsenal. But France had great ambitions and wanted to take back its seat in the political game of chess. In that regard, the nation wanted to reinforce its military industry, and thus put its hopes into the development of a medium tank. As such, France was one of the first nations to abandon the concept of heavy tanks. Companies like Forges et Chantiers de la Méditerranée (FCM), Lorraine, Somua, Renault and of course, Ateliers de Construction d'Issy-Les-Moulineaux (AMX) pitched their plans, and the latter won the competition. At the time, they didn't know they were embarking on a journey almost a decade and a half long. The story started in 1945 with a tank named Char AMX 45, also known as Projet 141 or NOM 141. Its first draft is dated from August, with 120 mm of frontal armour (lower frontal armour = 50 mm) and 50 to 60 mm on the sides. The turret was 110 mm thick, the sides 30 mm. By the end of that month, however, it was already redone. From 1946 to 1948, the vehicle drastically changed from one version to another. At some point, it looked like a distant cousin of the Tiger II. 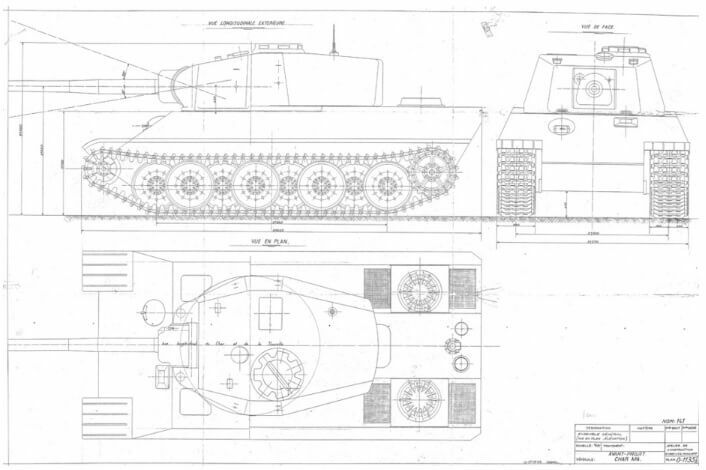 It often went above the 50-ton limit as well, depending on its armour thickness and armament. In March 1949, a major breakthrough was achieved. An oscillating turret designed by the FAMH company was introduced to the AMX tank development. By the end of that year, the tank was finally done. Unfortunately, it was already too late. The army wasn't satisfied with its default 90 mm gun. 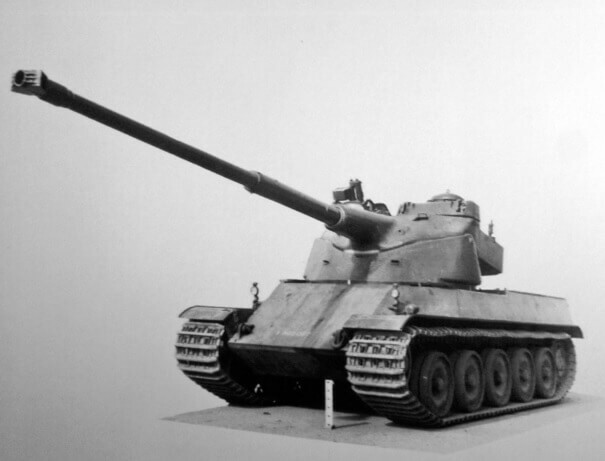 As a result, in 1950, the prototype received a stronger cannon, of 100 mm. It was strong enough to impress the French army. Two new vehicles were built, with reworked oscillating turrets. They weighed 55 tons, and one of them was actually presented to a French regiment stationed in Germany. Things started to look good for the AMX 50. 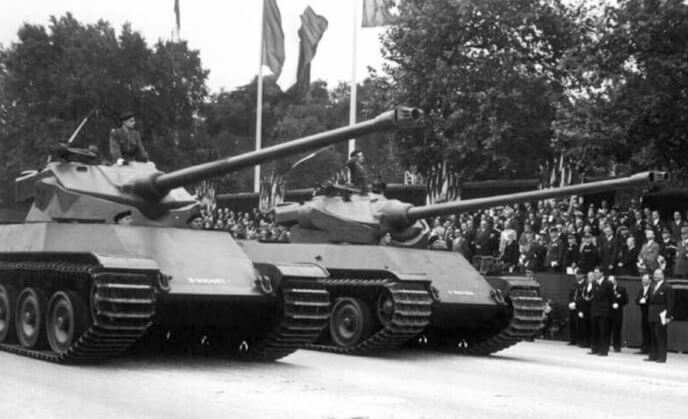 Even better, on 14 July 1951, the two prototypes paraded through the street of Paris to celebrate the French National Day, where they caught the eye of the Swedish military, as they were working on the Emil project. 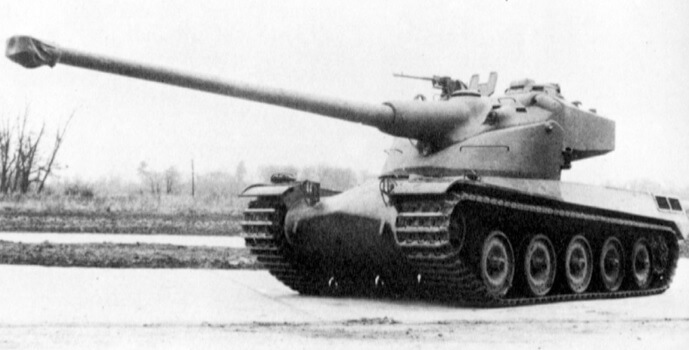 But another country was also interested in the AMX 50: the United States of America. They were so curious about it that France agreed to provide their first prototype for testing from December 1951 to March 1953. Unfortunately, American tests highlighted the problems of the AMX. This vehicle was an engineering gem, but its unusual turret was too vulnerable – one lucky shot and it would be jammed. The excitement stopped there, and the French company was back to the drawing board stage. A new gallery of variants was pitched. It featured a 70-ton version and prototypes with lighter turrets or bigger guns, like a 120 mm cannon. Putting such a boomstick on the AMX 50 turned out to be a complicated move. The tank was almost 60 tons heavy now, and about 3.50 m high, which is actually taller than the Maus! So in 1953, AMX decided to work on a flatter version of the vehicle, called 'Surbaissé'. But, in a surprising twist, this variant was put aside to work on a heavily armoured one called 'Surblindé'. 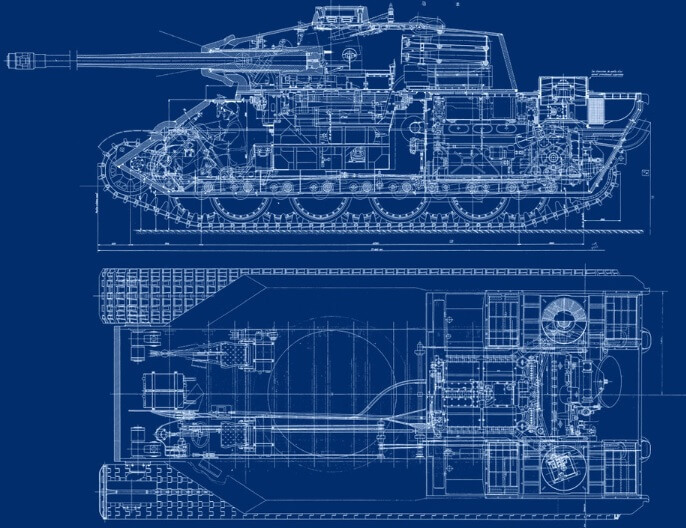 And yes, you're still learning about the story of a medium tank! Ignoring previous signs, the AMX company worked on this version until the combat mass of the vehicle reached almost 58 tons. And as you can imagine, bigger guns and stronger armour didn't save the AMX 50 from its problems. The bigger it got, the less reliable it was. AMX took another 5 years before going back to the lowered version. By then, it was already too late for the tank. Its last documents are dated from January 1959. Back then, the Soviet heavy tanks were supposed to be its main rivals, but they would have eaten it for breakfast. Now, the latest model of the AMX 50 is parked in the tank museum of Saumur, where you can admire it in its full tallish glory.